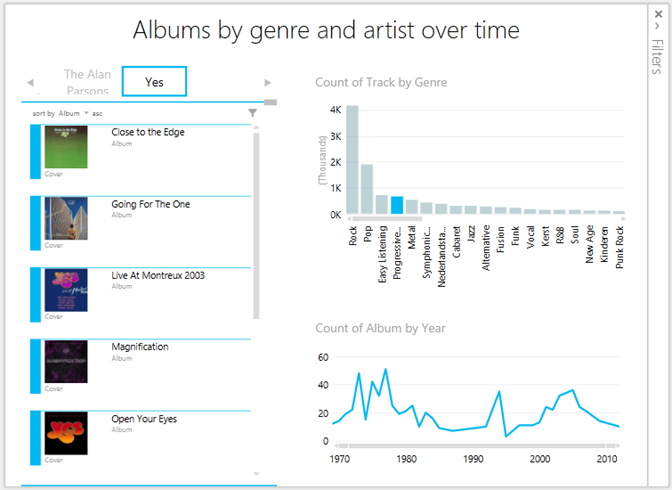 As some of you might recall, I have been talking about visualizing digital music collections using Microsoft tools. It all started back in the days of Pivot Viewer (At some point I was even part of a lustrous duo called ‘the Pivot Brothers’). If you are like me you have a digital music collection all nice and tidy complete with ID3 tags. A lot of tools exist that enable you to work with these tags and fix them. I particularly like Mp3tag (http://www.mp3tag.de/en/) which is free and is extensible. It also comes with an export function to CSV, although it does not export enough to my taste. I created my own export file and I suggest you do too. Keep reading if you want to know how and maybe rip mine. Of course you can use any other tool that has an export function, as long as you end up with something like a CSV. If you want to follow along in my step-by-step scenario I suggest installing Mp3tag. Again, please note that you do not have to follow these steps exactly. If you use another tool (not Mp3tag) or already have an export file you would like to use skip to the next step. To create the export with Mp3tag, open the program and navigate to where you music is stored (my collection sits on \\192.168.1.9\Music, which is a folder on my server). Once Mp3tag has listed all your files (might take a while if you have a large collection), select all files (EditàSelect all files or CTRL+A) and then choose File à Export (CTRL+E). You will get the Export dialog. Now, hit the first button on the right (the little page with a star to create a new export configuration and give it a name (I named mine “My CSV Export”) and click OK. Notepad will open and allow you to edit the export configuration. At this point you can copy and paste the code below into Notepad and hit save. Then, return to Mp3tag, select your export configuration, set up the export file name and click OK. Wait for a while and then click No to not display the export file. If you followed along you will have a CSV file that contains the export of your music collection delimited by semicolons. Your delimiter may be different. As a consequence the steps you need to take to get the data loaded may vary. Open up Excel 2013, click on Power Query in the ribbon and select From File à From CSV. Select the CSV file you just created and click OK. Now Power Query will do its best to give you what you want but as you can see it is not very successful (with the build available at the time of this writing). All is not lost however, because now we get to work with the magic of Power Query! First off, we need to get rid of all the errors we get in the data rows. Click open the steps fly-out on the right and click the first step (Source) and click the icon right next to it. Then in the ‘Open file as’ drop down box select ‘Text File’ instead of ‘CSV Document’ and click OK. This already looks a lot better, doesn’t it? Make sure to select the correct delimiter (semicolon in my case) and make sure that ‘At each occurrence of the delimiter’ under ‘Split’ and click OK.
Now select the ‘FirstRowAsHeader’ step and check the output. We now need to delete the last step (we will redo it ourselves later on). To do this mouse over and click on the little cross icon in front ‘ChangedType’. Now we need to change some data types but right clicking on the header of the column and choosing ‘Change Type’ and choosing the type you want to change to. BPM Number (select ‘Using locale’ first and then select ‘Number’ and ‘English (United States)’ if your country does not use a . as decimal separator. Now, split the Size column by right clicking on the ‘Size’ column header and selecting ‘Split Column’ and then ‘By Delimiter…’. Select ‘Space’ as delimiter and select ‘At the left-most delimiter’ as split option and click OK.
You will now get two size columns: Size.1 which contains the numerical value and Size.2 which contains MB or KB. Rename the Custom column by right-clicking the header and choosing ‘Rename…’. Enter ‘Size’ as your column name and hit enter. You now have got a single column that reports the size of the song in Kb. To wrap things up right click ‘Size.1’ and click ‘Remove’. Do the same for ‘Size.2’. Rename the column to Cover. As you can see every little step we took is represented in the script. Now click ‘Done’ to get the transformed data in Excel, where we will start on the visualization. Now we need to tell Power BI to read the cover column as a reference to an image. This is something we cannot do in Power Query at the moment, but we can in PowerPivot. In Excel, click PowerPivot à Manage to open up the PowerPivot window. In here, select your Cover column, go to Advanced and set the Data Category to be Image URL. Hit enter and name this column ReleaseDate. 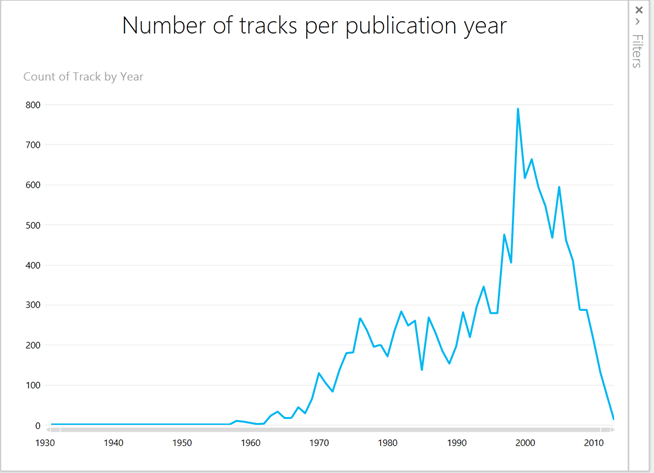 Apparently most the tracks in my collection were released around 2000, while the oldest track I have has been released in 1930. 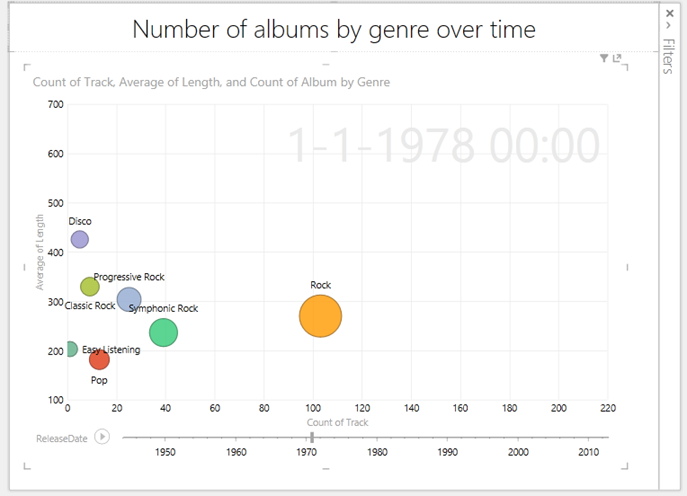 This clearly shows that in 1978 the rock genre was most popular (at least in the albums in my collection). However, the Disco songs were the longest on average. The play axis at the bottom allows me to play through my collection over time. 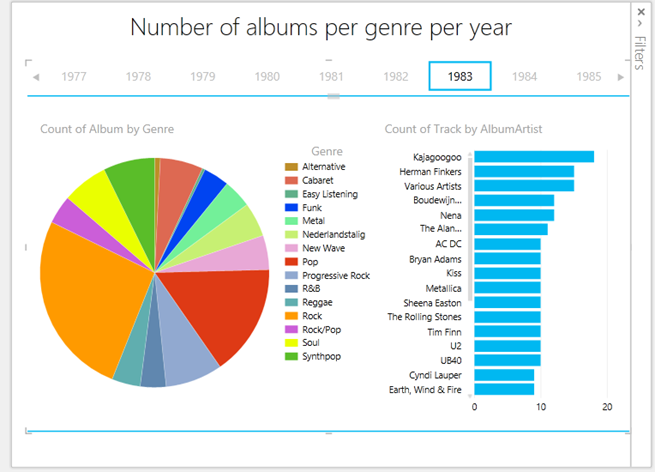 This shows the progressive rock genre and when it was popular. Also it shows which artists released albums categorized as progressive rock and which albums I have of that artist (I selected Yes). I will revisit visualizing my music collection when I have access to a BI Site, so I can show the latest visualization live. For now, this it it. Enjoy!